Should I hire piano movers to transport my instrument to the new residence or can I move it myself? How much piano movers will charge me? Can I move a piano without injuring my back? These are some of the most common concerns when it comes to moving a piano to a new home. You are about to move to a new NYC home and don’t know what to expect throughout the daunting moving process. Hopefully we will shed some light on your doubts and help you move your precious instrument safely. Moving a piano is associated with a lot of heavy lifting and carrying around, so unless you’ve already done it several times with well-trained helpers, hiring professional piano movers would be a wise thing to do. Otherwise make sure you are familiar with the most important lifting techniques so as to avoid hurting yourself or damaging the interior of your home. Moving a piano may seem rather scary at first, considering all the preparatory steps and the complexity of heavy lifting. No matter how brave you are, one wrong move could lead to serious health injuries during the move or to a damage to the property. Piano’s excessive weight and size make the transportation from point A to point B a real challenge for inexperienced people. Proper planning is the key to a successful household move. The decision to pack and move on your own may save you some money, but sooner or later you will end up wondering whether it was worthwhile. During the first preparation stage it usually becomes clear that some household items are more difficult to handle during the household move than others. Moving such a bulky item usually calls for a professional assistance. Instead of attempting to move it yourself, contact the local NYC moving company and find out more information about terms of the piano move. However, not all moving companies are capable of handling your household goods in a professional and efficient manner. Which is why you need to pay extra attention while researching NYC moving companies. The chosen relocation company should have a proper license and registration with the Department of Transportation. You can verify their USDOT number just to be sure that you are dealing with trustworthy movers. Furthermore, your piano movers should offer an insurance policy that would provide sufficient coverage in case the homeowner’s insurance is not enough. An extra coverage will provide an additional protection and your peace of mind during the process. Before you settle for a particular piano moving company, make sure to check their business background, online ratings and reviews as well as previous customers’ testimonials. Contact several companies and request moving estimates so as to get a clear idea about piano moving pricing. Researching reputable piano movers in NYC may require spending some extra money and time, but at least you will know that your precious piano is in good hands. 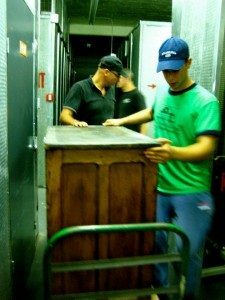 Experienced movers are properly trained to handle your precious goods with the utmost care and to make sure they reach the new place in one piece. Due to their excessive weight (up to 900 pounds) and enormous bulkiness, pianos are usually better off with professional movers. Also, no matter how sturdy they may seem, pianos are very delicate and any damage caused during the transport can be very expensive or even irreparable. Sustaining a personal injury or causing damage to your property is not the outcome you would hope for while planning your big household move. Are you willing to take a chance during this transitional and overly stressful period? If for one reason or another you decide to take on the responsibility of moving a piano yourself, you should take the following steps into account. – Make sure the pathways are clear from obstacles and that there are no potentially dangerous objects on the way to the moving truck. If you are moving on a rainy or snowy day, try to avoid slipping accidentally on wet floors. Also, the driveways and sidewalks should be free of mud, snow or ice. – Gather friends and relatives to help you out. Lifting bulky items is not something that you can do on your own, so get as many volunteers as you can to help you on a day of the move. – All people involved in piano moving should be dressed suitably. Everyone should wear comfortable clothes and appropriate footwear. – Always have in mind proper lifting techniques and do not overstimate your abilities and physical strength. The rule of thumb, use your leg muscles, not your back to do the heavy lifting. – Hasty actions and abrupt movements may result in health injuries, so make secure and slow steps while carrying your piano. Have regular breaks to catch your breath and then keep going. – Wrap the instrument with furniture blankets to protect it against scratches and external damage. – Lock the lid so as to keep the keys safe while in transit. – Wear work gloves so as to protect your fingers during the move and to have a firm grip. Distribute the weight of the piano across the entire body, not only on one particular area. – Use metal ramps to carry the piano down the stairs and to load and unload it from the truck. 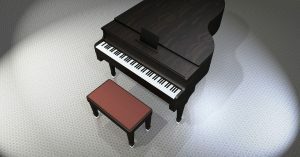 – Remove and secure piano’s legs before moving. Get the measurements before moving day so as to make sure it fits through doorways. – After loading the piano onto the truck, secure it properly with heavy-duty furniture straps. – Your piano should be loaded first into the moving truck. It’s always a good idea to put it in the back of the moving truck against the wall. – After reaching your new destination tune the instrument. But first consult with the professionals who will give you instructions on when and how to do that.